"An AI based video game with a linear story line with many interactive dramatic experiences to encounter." Facade is an AI based video game that works on a linear story line. The video game has real time rendered 3D virtual characters. The video game is a research experiment in electronic narrative and an attempt to move beyond traditional branching or hyper linked narrative to create a fully realized, one act interactive drama as claimed by the video game's main page. The Facade video game is pretty much a movie like experience, in which you goes through scenarios and pick the outcome you would probably pick in real life. The game took over give years of collaboration to make by the developer and is very unique in the ways in which you interact with the AI in the game. Unlike most video games, you feel like you are controlling a cartoon or movie by literally being a part of it. 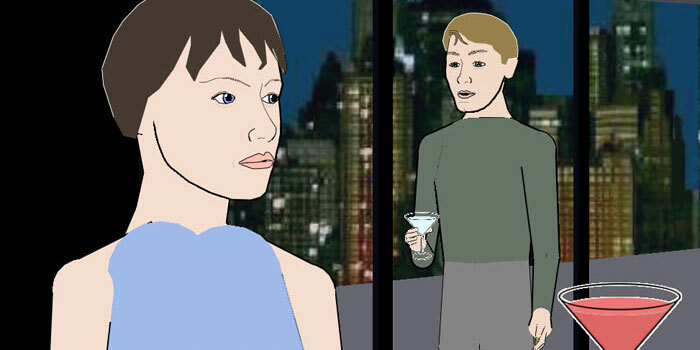 The plot of the video game is drama and emotional based in a real time 3D virtual world inhabited by computer controlled character. The player, then, experience a story from a first person perspective and interacts with these character who all have their own unique personalities with in the video game. You, as the main character and player in the video game, are supposed to use your own name and gender while playing the character of a longtime friend of Grace and Trip, two "supporting" characters in the game that you will commonly interact with throughout the game. They are an attractive and materially successful couple in their early thirties and you will learn more about them when you play the game, and throughout it. As you might have guessed, things get a bit tense in the game and you will encounter many dramatic choices in the game that you, your character, will have to go through and deal with. With many conflicts and interesting encounters, you will use your own personality to determine the outcome of the game. The game, Facade, was release as freeware back in 2005 and is only available for older version of Windows up to Windows XP.